Why do some people walk into a room and instantly the whole crowd turns and follows that person with their eyes? Why do only a few leave a lasting impression while others go unnoticed? What makes the difference? The answer is the “It Factor". Have you ever wondered why two people with the same humble background and similar education have dramatically different results with their careers and lives? Why some people are remembered long after they are gone? The answer is the "It Factor". The "It Factor" is a combination of charisma, self-discipline, enlightenment, spirituality, and karma. Such luminaries as Abraham Lincoln, John F. Kennedy, Gandhi, and Martin Luther King Jr. worked hard on their charisma to achieve success and make a positive impact on the world. From August 10, 2015 through September 22, 2015, Leesa will be discussing tips and techniques on how you can build your charisma from her book,"Discovering the It Factor within You: Developing Your Charismatic Personality." Drawing on a wealth of research and real-life experiences Discovering the It Factor within You has been dubbed the "life changer". The new release dives into the behavior changes and mind-set needed to unlock the keys to access your potential, develop charisma, enhance happiness, and maximize your spirituality. On the tour, she will be discussing tools and techniques for developing charisma, empowering others, performance and charisma, charisma in animals, love, spirituality, karma, auras, yoga and their relationship to charisma, and more. Go to http://discoveringtheitfactorwithinyou.com/discovering-the-it-factor-within-you-book-tour/ website to follow Leesa Rowland's full tour schedule or visit her website: http://discoveringtheitfactorwithinyou.com. 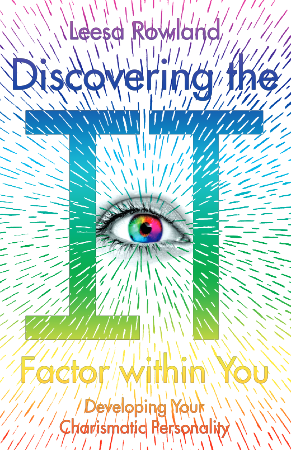 There will be a contest on Discovering the It Factor within You website with free giveaways of the book and other prizes. A portion of the proceeds of each book will be donated to the New York animal welfare nonprofit, Animal Ashram.non-profit organization.